But the wonder of all is man! from page 7 -- Steiner quoting a Greek poet. Those of us who grew up in the Forties in the USA knew the arithmetic of buying Coca-Colas: five cents a bottle or six bottles for a quarter (twenty-five cents). A stranger to this country, knowing only that Cokes cost five cents apiece, might have thought it strange that I would go to the store with twenty-five cents and return with six Cokes instead of five. They might say, "You must have made a mistake or else you stole one." Their mathematical thinking would be correct, but they would be wrong. Using a similar story, Steiner points out dramatically that reality does not order itself with correct thinking. Where man went wrong was in wanting to possess himself too early of the knowledge of the difference of good and evil. What had been intended for him at a later time, the temptation of Lucifer made him want to acquire earlier; that is the point. This original sin of mankind is still being constantly committed. For if men were not guilty of this sin they would care less how quickly they can acquire this or that truth, and would be concerned instead as to how they might grow mature for the comprehension of truth. In Chesterton's Father Brown mystery stories, the priest uses these four stages of Steiner's to detect crimes that, in some cases, no one even knew were committed until Father Brown solved them (See the Twelve Fishermen). Father Brown wandered around in a perpetual state of wonder, causing the sharp thinking police inspectors around him to think him addled, until finally the priest would cut directly to the reality of the situation more accurately than they, with all their finely honed correct thinking, could ever do. I am not that which thinks and feels and wills, I am what I am in my I, and I walk by the side of what I carry around with me like three sacks, one filled with my thinking, one with my feeling and one with my willing. Man was intended to be an onlooker of himself, not living inside himself. It was the temptation of Lucifer that lured man into that folly, and made him imagine that he should have intelligence, to identify with his thinking. "That is how man came to mistakenly connect correct thinking with reality." "Matter is a heap of ruins of the spirit." Imagine an invisible stream that breaks into visible pieces when it hits an obstacle. The stream is spirit (or form, as Steiner calls it), the visible pieces are matter. This concept reminds me of Einstein's equation E=mc2, which may be written as m=E/c2. Thus written we can say that matter (m) is energy (E) that has been stopped in its flight (c2). In fact, light is invisible while in flight, only becoming visible upon being absorbed by a perceiver. Physicists know how to convert mass into energy by fission and fusion processes, but are helpless at converting energy into mass, except for small increases of mass noted when elementary particles like electrons are sped up in a particle accelerator. The wholesale creation of mass from energy seems to be a job for the spirit, and Steiner suggests how the process proceeds. To understand the relationship of spirit to matter in man, consider man to be two men: the one a man of senses, glandular secretions, and digestion (short-lived processes) and the other a man of nerves, muscles, and bones (longer-lived processes). The nerves, according to Steiner, are materialized Intuition, the sinews or muscles are materialized Inspirations, and the bony skeleton of our bodies are materialized Imaginations. When these material components of our body decay, the spiritual components that were infused in them upon their creation are released as two distinct streams into the cosmos. One of these streams the cosmos accepts and the other stream the cosmos rejects. The stream that the cosmos rejects can only be removed by the same person who poured out the rejected stream. That person must create new outstreamings of a kind that will eliminate the original rejected outstreamings. 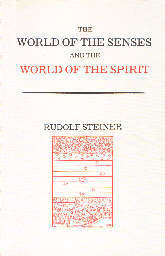 Thus Steiner builds for us a simple, elegant, process description of the phenomenon of karma. In other words, each one of us must clean up our own mess, no matter how many lifetimes it takes. What connects these two men, the one of senses, secretions, and digestion and the other of nerves, sinews, and bones? What connects these two sets of processes? Steiner's answer is the blood. Our blood is a special consequence of Lucifer's interference in man's evolution. "A perpetual surging forth from the spiritual and shooting back into it again -- that is what blood should have been." Instead Steiner says, "Lucifer brought it into a coarse materiality." Our blood is in a sense a creation of Lucifer and that is the reason he asks for contracts signed in blood. Blood is his own element. 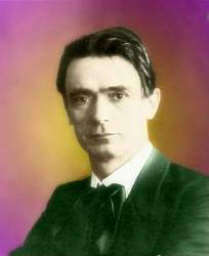 In these six short lectures Steiner has given us a comprehensive view of the Fall of Man when he succumbed to the temptations of Lucifer and of the processes of destruction that pour outstreamings of Intuition, Inspiration, and Imagination into the cosmos for the building blocks of future civilizations. Each lecture deserves detailed study and this short review can only hint at the treasures contained within.